Juffern AG's commitment to environment and health & Safety (EHS) standards is an important consideration in all procedural aspects; we consider it a fundamental responsibility to employees and to the environment that we all share. The power plants of our customers are often equipped with flue gas desulphurisation (FGD) systems. Power plant operators can thus contribute to minimising emissions. The flue gas treatment aims primarily at minimising the emission of sulphur dioxide (SO2), nitrogen oxides (NOx), and dust particels. Back in the 1980s, Juffern AG began the complicated construction management of FGD-systems. Thanks to our worldwide activity in various plants and with diverse systems, we were able to acquire a broad know-how. FGD-systems are a major procedural innovation. Today, the pollutants from power plants have little chance of escaping into the environment. In collaboration with our customers, we implement existing and new process technologies. Do you have an idea how you want to change and improve your process? We can assist you in realising your project. Contaminated waste waters from industrial plants have to be cleaned and treated until they comply with legal requirements. From neutralization to hydroxide sludge treatment and the necessary chemicals, we know our way around this subject. 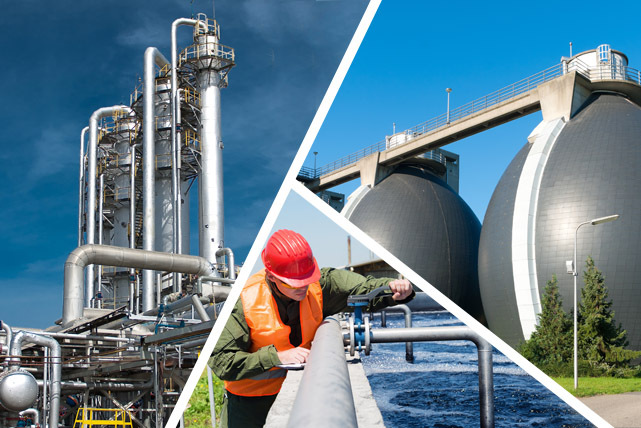 We offer professional and target-oriented support to realise your wastewater treatment plant.